The answer is yes, and they’re called suppositories. This entry was posted in Cultural Marxism, Humor & Quizzes, media bias, Political correctness/cultural marxism. Bookmark the permalink. I really laughed for a very long time in this episode…..thanks, cuz! I didn’t see her on his list. Sad she passed so young. very sad and very shocking. I caught Big Mama Tea’s name there. No, that’s commonly at the end. Watch the video. JDG runs a list starting at 3:46. My big complaint about Conservatives has always been that we don’t stick together like the left. We need to come together and get tough, now more than ever before. It’s critical for freedom as we know it. I would like to say first of all CTH is my all time favorite. That said, with the midwest underwater with all the flooding, all the cattle, sheep, freezing, drowning, and starvation, because farmers and ranchers can’t get to them, all the houses that have been literally torn down by fast water moving 24″ inch blocks of river ice, there is virtually no coverage of any of this. Yet even this web site has space for this kind crap. And while I’m at it, about the mosk shooting. Everyone is sooo pissed off at the video. If this happened at a Christian church every damn network would be running it 24/7 and there would be a lifetime movie out in a week. Note: It’s being said that the fields are so soaked that very little corn will be planted this year. That and the loss of cattle you can expect higher food prices this year so plan accordingly. “space for this kind of crap” ? No muskrat love for you! 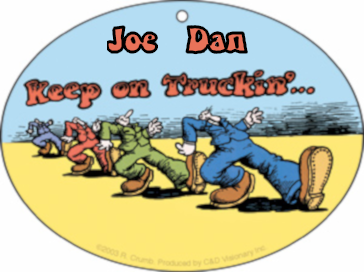 Joe Dan has mellowed not that he needed to. almost warm and fuzzy, great job! Thank you guys so much.. and a special thanks to SunnyD. Oopsey – Joe Dan – will take the lashes with a wet noodle – soweee, Joe! God Bless you Joe Dan. Yes Gb Bari….True…and honestly….We need some laughter….It’s good for the soul ! My wife and i both-given our Tennessee, Kentucky etc. roots..
One of the Best !!! Thank you, Joe Dan. It is easy to make a caricature of the left. But the right are equally profligate when it comes to spending other people’s money in particular the next generations. The national debt tripled under conservative icon Ronald Reagan. Grew under Bush 41 and Bill Clinton. Doubled once again under both Bush 43 and Obama. And is on track to grow by a trillion dollars each year under Trump. The fact is both the right and the left, both Republicans & the Democrats are quite happy living beyond their means and sending the bill to their grandchildren. The fact is that the biggest subsidies goes to the most well connected. Amazon has not paid a dime in taxes. Wall St got trillions of dollars in the bailout of their speculative losses so Republican Paulson didn’t lose out on his hundreds of millions of dollars of Goldman Sachs stock. The US spends more than the next 10 countries combined on defense. The Russians spend 10% of what we spend and could destroy the continental US if we ever got into a war which the neocons are desperately trying with their Russian Collusion nonsense. How many trillions were spent in the neocon inspired endless wars in the Middle East & Asia? What benefit did the Deplorable receive? And even Trump packs his administration with them. Look at the hundreds of billions that goes to big ag every year – companies like ADM and Cargill for corn ethanol, soy diesel, high fructose corn syrup. The bottom line: There is a very limited constituency for fiscal probity. For living within our means. For limited government. For a competitive economy where there is no collusion among big business and big government. One benefit is the elimination of 10s of 1,000s of Islamic terrorists on their turf thus making the world a safer place. Trump with his minor foibles mentioned has made America a better place just in the past two years. Laughter is good medicine, massive! Nice to know – thanks barn! Barnabusduke-I can’t even play a 6 string and I’ve been trying for MANY years. Watching a Joe Dan is like eating a bacon sandwich…tasty…..love em both….always look forward to the next one…..thanks Sundance. God bless Joe Dan and pass the frog legs! Watched it on your website. Player worked fine for me. I an genuinely and truly saddened by JoeDan’s being removed from Youtube and other hosting. It’s utterly disgusting. It’s beyond time we had conservative representation in tech. I would suggest using Amazon cloud (AWS) but this is Amazon… they will sell you access to their computers to run password cracking software so powerful that pretty much every password shorter than 12 characters can be cracked in a couple of hours. You can do pretty much anything you like whether or not it’s legal, but I suspect they will find hosting conservative content to be in violation of “something” and have it yanked. We need “safespace.com” (probably a domain name already taken) to host conservative content for “free” but funded by donations somewhere or somehow. I truly hope something like this happens. The left will complain endlessly and launch all manner of hacks and attacks but there are ways of controlling and limiting the damage they can do. I’m reminded that Dr. Jordan Peterson and others have dumped patreon and other funding sources because youtube and patreon and other resources have proven to be vulnerable to leftist influence. And by the looks of things, Fox news is also incredibly vulnerable to such influence and it doesn’t need to be the case. Despite all other things, the left is currently on the losing side of the argument. They used to appear to be reasonable if condescending and didn’t often have to resort to anything as overt or obvious as what we are seeing these days. Their violent factions are everywhere and police are being ordered to look away or worse. The leftist media in all its forms is now overtly displaying unreasonable and unacceptable bias and hatred of anyone with whom they disagree. As this remains a publicly visible tactic, more and more people are “walking away” from the left as most liberals genuinely believe in liberty and this is not freedom or liberty. This is pure tyranny. Over time, the leftist run businesses will have to change but it will take a very long time. If conservative run businesses compete now, they can go on to replace the leftists’ platforms entirely. And I have to say, there should be NO facebook replacement. It was a dumb idea from the beginning. I will go into more of why that is if someone is interested to know why, but for now it’s just a very dumb idea. Joe Dan I’ve been hooked for a couple of years now! Fantastic..one of your best! Can you please bring back the dancers at the end of your show? Who were they? I loved them! Ha! Reminds me when the Dr. suggested he write a Rx. for me, for statins.